The Memory Keeper’s Daughter was that rare thing, a true word-of-mouth best seller, and I want to begin this letter by thanking all the readers who have been part of this amazing experience. I appreciate your passion for books and for stories, your intense and thoughtful conversations, and the comments you have sent to me from across the country and across the world. Now, I’m really pleased and excited to introduce you to my new novel, The Lake of Dreams. Set in the beautiful Finger Lakes area of upstate New York, this novel is the story of Lucy Jarrett and her discovery of a hidden past, glimpsed first through fragments of old letters and traces left in stained glass windows. Lucy’s quest through the artifacts of history brings her face to face with the dynamics she fled the summer after her father drowned; it compels her to make an inward journey, too, one that will alter her understanding of herself and change the course of her life. The Lake of Dreams is a book I’ve been imagining for a long time. Years ago I wrote a 400 page draft of a different novel that had some of these same thematic concerns, including a complex family history, the importance of the land, and the comet connecting generations. That early novel ended up in a box in my basement, as so many first novels do, though I did return to it from time to time, and once I even made it 200 pages into another version before I put it aside again. Meanwhile, I finished my story collection, The Secrets of a Fire King. I wrote The Memory Keeper’s Daughter. 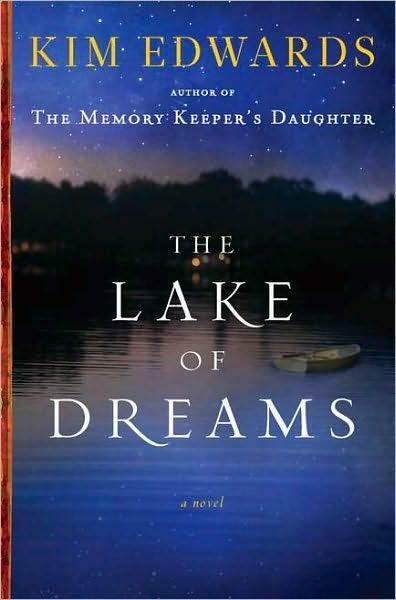 Yet the essence of the earlier story persisted, and shortly after The Memory Keeper’s Daughter was finished, but before it was published, I started writing The Lake of Dreams. Those earlier, discarded drafts had finally brought me to the heart of the story, and this time I had the voice, which is always the crucial discovery. Then the characters from the past began to emerge, with all their fascinating revelations. I immersed myself in the writing, and this new novel was well underway before the excitement of the best seller lists and book tours began. When things began to quiet down again, it was a real pleasure to return to The Lake of Dreams, to Lucy and her family and the mysteries of glass, and to the story that was waiting for me there. I’ll be going on tour for The Lake of Dreams in January. Best wishes to my readers! I hope you enjoy The Lake of Dreams.